"UMH Properties 50th Year Anniversary Holds a Special Place in Manufactured Housing Industry"
“UMH Properties, Inc. Honored with Manufactured Housing Institute's Community Operator of the Year and Land-Lease Community of the Year Awards"
"UMH Properties, Inc. Receives the Manufactured Housing Institute's Community of the Year Award"
"UMH Properties Celebrates 50 Years on New York Stock Exchange"
"Top 25 US Equity REIT Total Returns in 2016"
Providing quality affordable housing and creating long-lasting value for our shareholders since 1968. 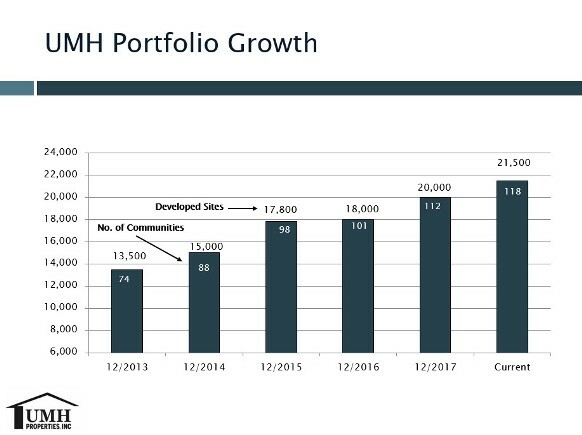 UMH Properties, Inc. is a public equity REIT (real estate investment trust) that owns and operates a portfolio of 118 manufactured home communities with approximately 21,500 developed homesites. These communities are located in 8 states throughout the northeast: New Jersey, New York, Ohio, Pennsylvania, Tennessee, Indiana, Michigan and Maryland. In addition, our Company owns approximately 1,700 acres of land for the development of new sites. Last year, UMH was honored by the Manufactured Housing Institute’s “Community Operator of the Year” award. In addition, for the third consecutive year, UMH won Manufactured Housing Institute’s “Land-Lease Community of the Year” award. These awards recognize UMH’s long-term commitment to innovation and advancement of the manufactured housing industry, and our dedication to providing quality affordable housing at all of our locations. UMH has a wholly owned taxable REIT subsidiary, UMH Sales and Finance, Inc. (S&F) which sells manufactured homes into UMH communities. If you are looking to purchase a new home in one of our beautiful communities, whether you would like to reside in a relaxing country setting or closer to an urban lifestyle, please visit the UMH Sales and Finance site at www.umh.com. UMH Sales and Finance, Inc. is licensed by the Pennsylvania Department of Banking, NMLS 200331. We encourage you to visit our website further where you will find our most recent Annual Report, Video Gallery, Dividend Reinvestment and Stock Purchase Plan description, SEC Filings, and other key information. To receive an investor package, please feel free to contact our Investor Relations Department at 732-577-9997 or via e-mail at ir@umh.com.